Re-advertised due to non paying bidder - Used a few times, some slight damage (melting) from a fall where the exhaust landed on the boot. Other than that I’m very good condition. Size 11 UK (46 euro). 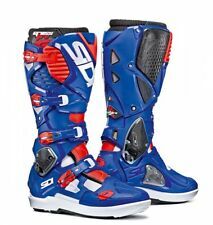 Sidi Trial Boots 2019 size 7. Bran new in the box , never been worn outside , no marks , payed £200 for them last week , selling as they are to small . Size 12.5 but being Sidi they are a narrow fit so more like a size 12. SIDI SRS Adventure Soles - size 45/46 (New). Dispatched with Royal Mail 1st Class. 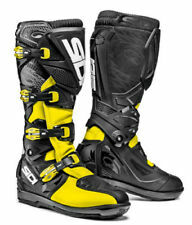 TheSidi Crossfire 2 SRS Motocross Boots 48 White Black Yellow Fluo (UK 12.5) are part of the latest Sidi collection. It is the passion for style that only those who choose to move on two wheels can have. 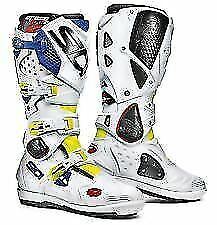 Sidi Crossfire 3 SRS Motocross Enduro Boots in White Blue Red Fluo. Known for their excellent protection, comfortable fit and replaceable parts, the Sidi Crossfire 2 has been a top pick with dual sport riders and motocross racers alike. Just search and see. Really nice pair of youth boots. Fix Shin plate. Rubber sole. Designed for young riders. 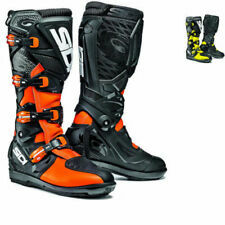 TheSidi Crossfire 2 Motocross Boots 40 White Black Yellow Fluo (UK 6.5) are part of the latest Sidi collection. It is the passion for style that only those who choose to move on two wheels can have. Other Sidi Crossfire3 SRS Boot features 2019 Sidi Crossfire 3 SRS Motocross Enduro Boots in Black Ash. Known for their excellent protection, comfortable fit and replaceable parts, the Sidi Crossfire 2 has been a top pick with dual sport riders and motocross racers alike.